Generally speaking, I refuse to watch war films, especially those recommended to me as ‘good’ and ‘realistic’ because I can’t bear seeing so much death. Industrially manufactured deaths now, the opposing side doesn’t even have to be there any more to pull the trigger and people are just as dead at the end of it. Possibly worse, they survive and have to go back home to Poundland, council tax and pop tarts. Films either glorify wars, completely dehumanise them or on the rare occasion they are realistic, they make me sick to my stomach. Slightly embarrassing confession, especially for a film buff and self proclaimed badass such as myself, I never made it past the opening scene of Saving Private Ryan. I was about 13 when I saw it and the only thing that I could think was ‘what about the mum’s?’. Take a second to think about that horrifying thought and I guess you’ll see why I can’t bear to watch those films. There was a point to that little ramble too – the point being that I have never read a book about war before, always assuming they’d be along the same vein but I to admit that this one was a little different. This story was from he perspective of a reluctant soldier who had no desire to go to war or leave his life behind him, but for better or worse, he went and he became a soldier in the truest sense. He got shot up a bit, saw most of his friends die then went back home and had to start rebuilding himself. There was no glory in it, he didn’t even know what he was doing there but he became good at what he did out of necessity. 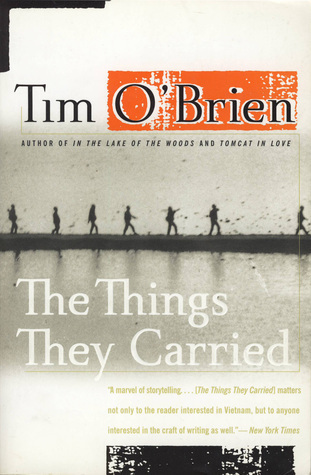 The book was written in a very factual way, O’Brien tried to keep it factual and paint a vivid picture of how things were – not how he saw them to be. He explained very masterfully the power of storytelling in keeping people sane out in the least sane environment. I think this story will stick with me a long time and has opened my eyes to a new genre of literature, though I don’t think I’ll be immersing myself in it all in one go – easy does it! I certainly won’t be reading any rubbish about wars from the political perspective any time soon. I have never read true war stories either, though I’m no topposed to them. But I’ve read stories involving war (in fact, I’m reading one in this moment) and I like them. War stories take the worst, but I believe also the best out of the characters (as they do with people).